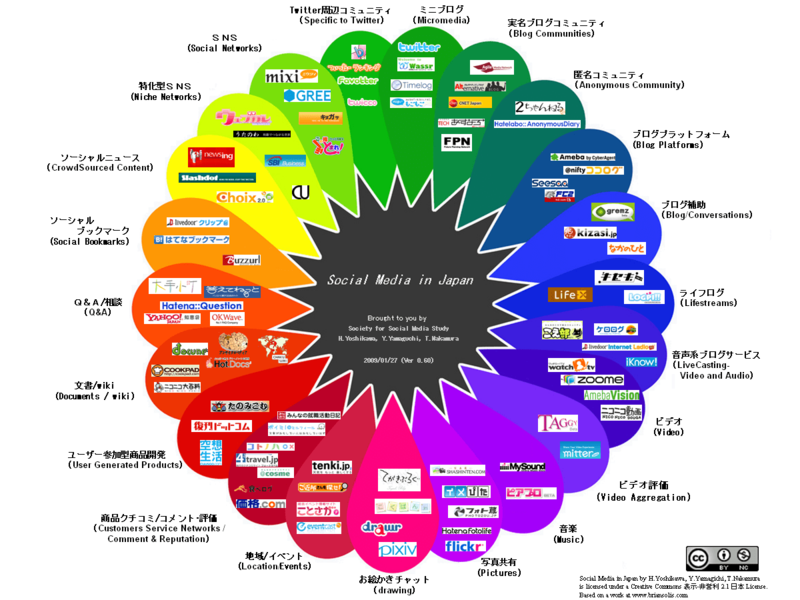 Based on the concept presented at www.briansolis.com, H. Yoshikawa, Y. Yamagichi, and T. Nakamura rendered the Japanese Social Media Prism. This prism is being maintained constantly, so make sure you visit the original blog post for updates. Each Flower petal represents a Service Category (written outside the petal). Better known services are placed closer to the edge of each petal. International Services like Ustream, Twitter have very distinct Logos, not only a simple web Logo, but managed to create a Global Brand. Although there are many Japanese web and social services, their logos do not manage to become a brand. As an example, Mixi echo (twitter like service) did not re-brand. The Logo the author liked best is by favotter. There aren’t many International Services, but Last.fm is well known. What is the situation in Japan? Piapro is an example of CGM (Community Generated Media) service; while only MySound provides unmixed music (Except for Mobile Phone services). It is quite clear that Copyrights issues have affected the growth of this business, and is evident in the prism. If I have to say, in the US, Blog community is active, therefore services and Infrastructure are well provided, while in Japan, there is certainly a Blog Community, but not as strong. Word of mouth and comparison contents have more presence, which may be due to influence from old style anonymous culture (2 Channel). Original post can be found here [JP]. Avi is an Israeli Hi-Tech professional who recently relocated to Japan. Avi has development and marketing experience in various fields: VoIP, Linux Kernel and most recently Mobile WiMAX. Passionate about Technology, Languages, Culture, Music. Avi is currently improving his Japanese while writing Open Source Software.